Winter & Spring Patio Colour. Buy 1 Get 1 Free! 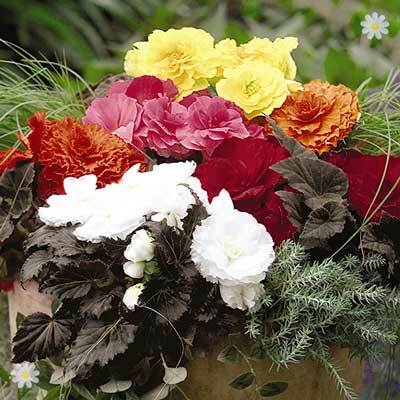 A new twist on the ever popular Non-Stop Tuberous Begonia range, the Mocca series has the same big, ruffled colourful flowers on Non-Stops, but now set off against the most sumptuous velvety brown to purple leaves, seemingly making the colours even bolder and brighter against their dark and moody background, standing out like jewels. Look out for the orange and pink in particular. Great in borders en masse, or in large tubs, in sun or shade, they will form little corms that can be lifted in Winter and stored dry and replanted the following Spring (although we would much rather you wanted even more from us next season after their fabulous displays this year! ).